At the Wednesday, August 22 meeting of the Elk Grove City Council, the city's economic development director, under the dictates set forward by his city council bosses, swung for the fences. In a presentation by Darrel Doan a new incentive program called "Invest Elk Grove" was introduced. The new program, which has the ultimate goal of landing the next Google or Apple Computer, will be funded with $800,000 of taxpayers money and will primarily target two types of high-tech businesses - pure starts-up and so-called scale-up companies that are seeking additional funding. While the establishment of the program is laudable, is it dealing in realism or is it a just another feel-good symbolic claptrap conjured up by city leaders to make it look like they are doing something other than expanding city limits for their housing developer buddies? During the presentation last Wednesday night, Doan painted the program as having the potential to bring the next major thing in technology to Elk Grove. 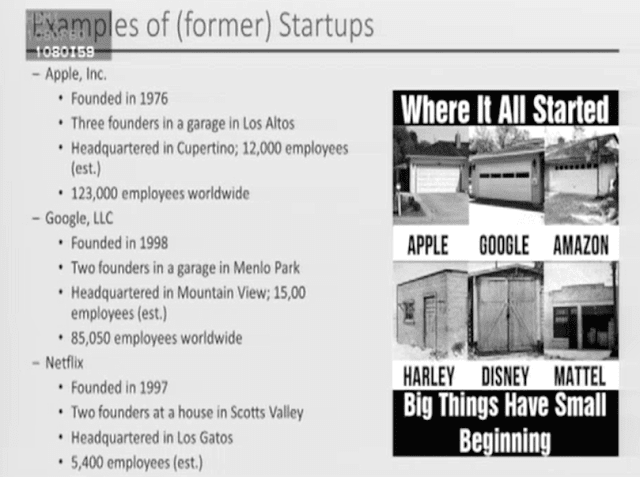 In his Powerpoint presentation, Doan dangled a slide highlighting Google, Apple Computer and NetFlix's origins in garages and implied "Invest Elk Grove'' will attract the next version of one of these companies. While the garage start-up origin has become a cliche used by every flim-flam economic development director between here and Portland, Maine, Doan stuck to that script and indicated the city has some excellent prospects. Following his presentation, the most crucial part of the presentation was questioning by Vice Mayor Darren Suen. During his questioning, Suen inquired how is the city going to reach the guy or gal in the dorm at Stanford, not Sac State mind you, who is sitting on top of the next Google? Doan explained the Bay Area-domiciled representative for the Greater Sacramento Economic Council would be contacting prospects about locating their business to Elk Grove. For his part, Doan will not be personally recruiting in the Bay Area, the hotbed of tech startups. It is here, where the flaws in this program, especially if we are to believe it will bring the next Fortune 500 multi-national tech company to move and headquarter in Elk Grove, lie. First, one of the reasons places like Silicon Valley flourish is because they have Stanford, a prominent research university in their backyard. Google founders Larry Page and Sergey Brin were Ph.D. candidates at Stanford. While Sac State is a respectable institution, it is not a research university and is not considered a hotbed of technological innovation. UC Davis is a research university, but its area of specialty leans toward biology and agriculture. Not having a research university specializing in programs directly related to technology puts the region at a disadvantage. Google's initial funding at the time of their incorporation on September 4, 1998 was a modest $100,000. However, less than nine months later, they had received venture capital funding from Kleiner Perkins and Sequoia Capital totaling $25 million. And here is the point - the dorm hall student Suen referred to sitting atop the next big thing is probably at Stanford or other notable research universities across the country. While $150,000 from the City of Elk Grove might help, they do not provide the multi-million dollar seed money available from Bay Area venture capital firms like Kleiner Perkins or Sequoia Capital. Furthermore, there seems to be a symbiotic relationship between the venture capital firms and the start-ups they funds. When the venture capital firms give millions of dollars to young entrepreneurs, they tend to be located not too far from their Bay Area offices or at least other branch offices so to monitor their progress. Consider the case of Facebook. After being founded by then-Harvard student Mark Zuckerberg, the company moved to Palo Alto where it quickly accessed seed capital from a host of wealthy investors and venture capital firms. If the next Zuckerberg at the out-of-state institute like Harvard, Yale, MIT or others has the next greatest technology that will lay the foundation for a multi-national corporation, will they go knocking on the doors of Elk Grove city hall for $150,000 or the Bay Area venture funds for millions of dollars? So while the "Invest Elk Grove" grants of up to $150,000 may attract some interest, the tech companies they draw will not be the top shelf variety. Sure, it could lead to the development of small companies employing a couple of dozen employees, but don't let the city council or economic development director fool you. The real big ideas that establish the real big multi-billion dollar multi-national corporations will flow to big money, and the real big cash is with the Bay Area venture capital fund. For as much as they think they can, or have you believe they can, Elk Grove's David will not be slaying Kleiner Perkins or Sequoia Capital's Goliath anytime in this century. I'm thinking the city should buy the mall property, tear down the sad looking shell buildings, and build...garages! Some could even be replicas of the famous garages like HP and Apple founders had. Build little alleys and give them street names and addresses for the garages. Doan used the cliche term 'unicorn', so I say name this Project Unicorn! Run ads in the Bay Area and entice entrepreneurs to make the hop, skip, and jump to Elk Grove and own a place in Project Unicorn! You want incentives? Just ask! Elk Grove is rapidly building a reputation as an easy mark, so get that head start for your business and come to The Projects!